It was overcast this morning, but at least no real chance of thunderstorms, thank goodness! 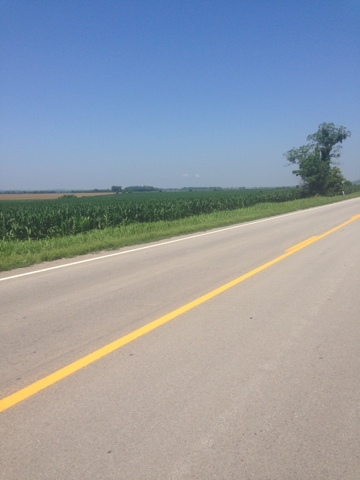 We headed out of Carbondale to Murphysboro on Route 13, and the rising went by uneventfully. 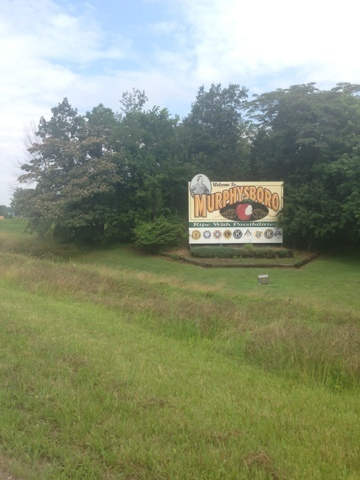 Murphysboro's slogan is "Ripe With Possibilities". 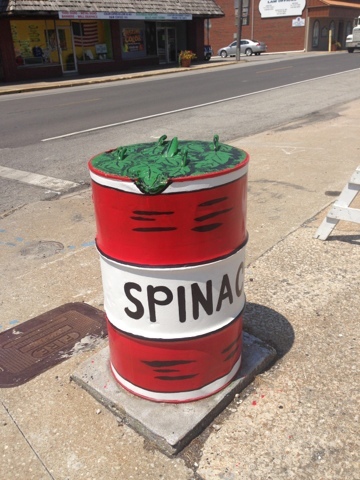 I'm fairly certain the word "ripe" doesn't belong in any city's motto, but oh well! 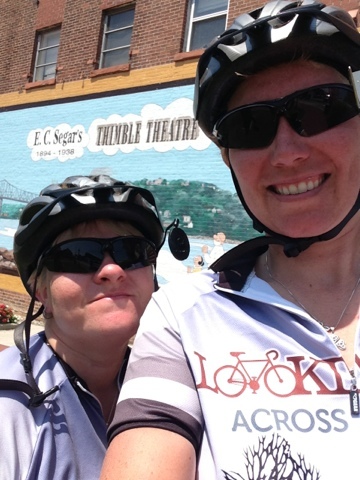 We decided to switch up the Adventure Cycling route out of Murphysboro to shave some miles and hills off of our day. We stayed on the main roads, with minimal traffic, and probably saved ourselves 10 miles or so. 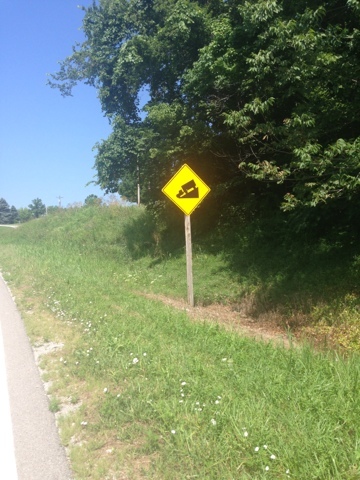 Illinois plays a little fast and loose with their road grade signs - but I guess what constitutes a big hill in Illinois is very different from Virginia! 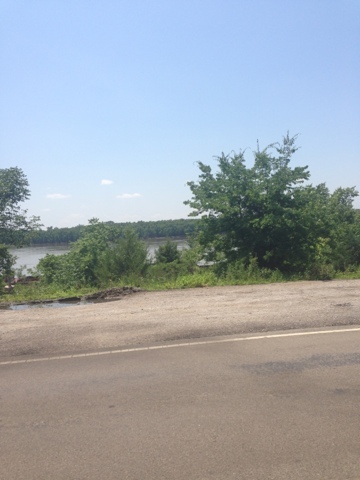 We had decided to take the Mississippi Levee Alternate route, which is very flat until you get close to Chester, and had a really nice, fast ride throughout the morning. The only problem with this route is that there aren't any service stops, but we survived. This was probably the quickest, and one of the most enjoyable rides of the whole trip so far. When the route eventually ran right alongside the Mississippi, there was a stop for coal trucks to load their coal onto river barges. This area got a bit dangerous, with huge coal trucks coming from both directions, and they are only concerned with getting their coal to the barge in the quickest manner possible. We rolled in to Chester in the early afternoon. 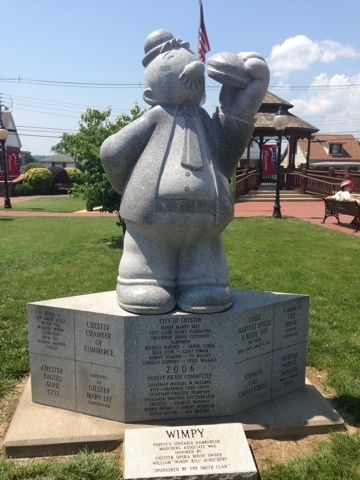 Chester is the birthplace of the creator of Popeye, so we spent some time checking out their Popeye stuff while trying to get a hold of the Fraternal Order of Eagles, who have a bike hostel in town. After a couple of hours with no luck on that, and grabbing a late lunch/early dinner, we settled on staying at the one hotel in town. After some much needed showers, I proceeded to burn popcorn in our room's microwave, which smelled amazing for the rest of the night. We watched a Pawn Stars marathon, and passed out.